Lower back pain is one of the top demands for physiotherapy in London – Shock Wave Therapy can get you “back on the tools” – FAST! Injuries do not discriminate and can impact any job or vacation. The number of lower back complaints needing physiotherapy in London is definitely one of the most common. Have you ever seen a group of tree surgeons at work? Tree work is hazardous and requires a high level of technical competence to be done safely. It requires properly trained and experienced people. No one wants a tree branch to cause injury or damage their property! A tree surgeon requires many skills but a strong core strength is essential. Any physiotherapist will tell you a basic understanding of the human body is that a strong core will make you less prone to back injuries. In his work, a tree surgeon places a lot of stress on the lower back, and back sprains and strains injuries can occur. Being a tree surgeon can place a lot of strain on the lower back. No work – no pay! A tree surgeon may be carrying a long-standing chronic injury. Many tree surgeons are self-employed and extended, unpaid, time away from the job due to injury can cause significant stress and pressure. At BODY FIRST UK, we understand the importance of getting people like tree surgeons back to work as quickly as possible. Shock wave therapy is one of the best methods to achieve this. Known as a rapid pain relief treatment, it is a crucial tool for physiotherapy across London. 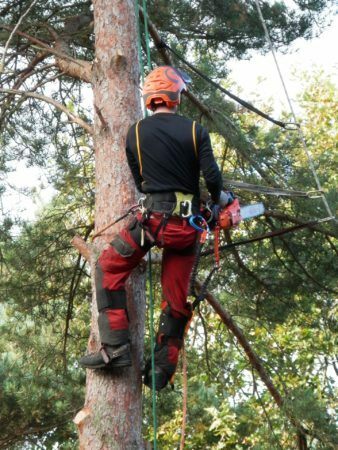 An injury that the tree surgeon will likely be carrying is a long-standing chronic injury. Remarkably, 80% of people who have attempted shock wave therapy after exploring other options reported that it had helped eliminate their pain! When quizzed on why they didn’t use shock wave therapy sooner, the most common answers were; a lack of awareness or a lack of trust in not fully understanding the process! This is not uncommon, many people often take time to build trust with new procedures. Top sports clubs and have been using shock wave therapy for years, and it is now beginning to take off in the public domain as physiotherapy in London. One example of how the treatment works as a rapid pain relief and curing chronic pain is the release of trigger points. Trigger points are the principal cause of pain in the back, neck, shoulder and limbs. Without getting too scientific, parts of the body start to contract so tightly, that the cut off their own blood supply. This results with waste products to building up around the area of pain, causing irritation to the sensory nerve endings prompting a vicious circle of further contractions! Otherwise known as the ‘metabolic crisis’. The shock waves target these areas and their acoustic energy unblocks the cycle stimulating metabolic activity, breaking the vicious cycle and which promotes healing. No amount of pride will cure the chronic lower back. Even a single session of shock wave therapy has been shown to generate massive improvements by triggering the above response. Treatments can be as quick as a 15-minute burst! So, if you are a tree surgeon, with ongoing lower back problems, swallow your pride and come visit us at BODY FIRST UK.